They had these giant windows that were open to the street. I took a glance inside, and I liked what I saw. I was starting to get a feeling that this was going to be a good night of pinball. The first real indicator that HQ Beercade was a quality place was these two dudes: Mark and Frank. I guess they were technically bouncers, but really they were more like super friendly dudes who got us pumped about pinball while they checked our IDs. "So how does this place work?" I asked. "All the machines are on free play," they said. I reached for my wallet, figuring that the cover price would be somewhere in the $10-$15 range, like many of the pinball museums and arcades around the country that use the free-play model. They laughed at me, waved away my wallet and said "There's no cover charge. Just go have fun!" !!!???!?!?!!! Head-spinning, I went inside and right off the bat I saw the second indicator that this was a quality pinhall. BOOM! Dedicated tech guy. Not an overworked operator with a route all over the city. One guy, who's job it is to keep these machines in good working order. I can't remember any tech problems the whole night, so this guy obviously knows what he is doing! Honestly, the way most Stern games are priced out in the wild these days ($1 per credit, $2 for 3 credits) I can't get too deep into the gameplay because it's just too expensive, so this night I really focused on playing Avengers, X-Men and Metallica, because it didn't cost me a cent. At some point Beth arrived with some other CCS alumni, including Dakota McFadzean (pictured below with Beth) and Melanie Gillman. I feel obligated to point out that Beth, Melanie and Dakota are all past April Fog Memorial Scholarship recipients!!! At one point I looked up from a game of Avengers, and realized that I recognized the guy playing pinball next to me. At first I couldn't place him, and then I realized he works at Stern Pinball! 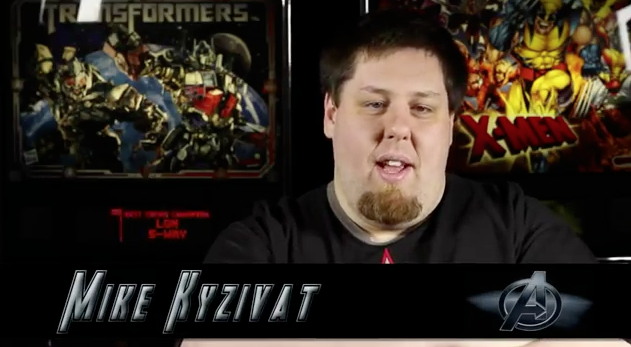 I remembered him from all those videos they have been posting about the making of the recent games, his name was Mike Kyzivat. I told him that I was one of the Drop Target guys, we shook hands and then got back to playing pinball. The only real downside to the night was that it was during the Stanley Cup finals, so they had the game on SUPER LOUD, which made it impossible to talk, or hear any of the music or sounds coming from the games. I know the idea of this free-pinball business model is that I'd choose to come to this bar over the other ones because it has free pinball (and video games in the back - snore). Then, while I played pinball, I'd drink a bunch of beer, and my hefty tab would outweigh the cost of the machines and their upkeep. I hope that actually works, because it's a great bar, but personally I spent about three hours in there and didn't buy a single beer. I don't think they were hurting though, because by the time we left the place was PACKED. If I lived in Chicago I would visit this bar all the time, but early in the evening before things got too crazy. 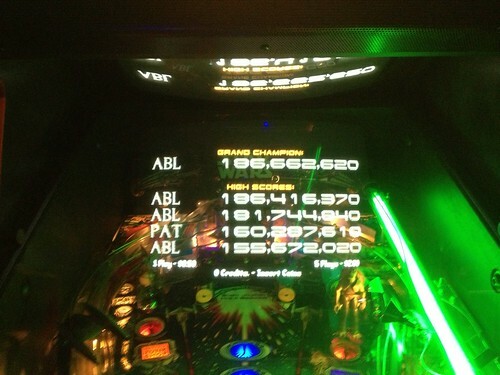 Oh hey, I also got got a 184 Million on their SW:E1 machine, snagging the #1 high score. Hopefully it will not be the last time I enter my initials at this bar. Next time I visit Chicago, you'll know where to find me! Hello! Normally, when I do work for the Professional and Amateur Pinball Association, I have to wait a month or two until the event happens to let you guys know about it! 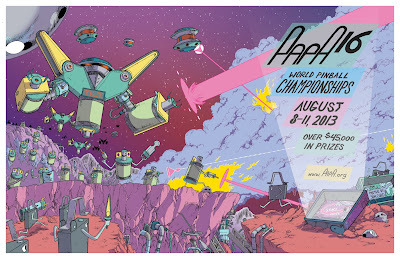 This poster I did for the 16th World Championships was released right away, though! I'm super pumped! I'm working on some more pinball goodies, so stay tuned. Sorry I've been so incommunicado on the web, but there's too much fun stuff happening! I went on a day trip to Maine the other week, and have some good Pin-venture stories for you all! Pinball is in my veins! Steve Bissette sent this link my way a week or two ago, and I still can't get over it. This is absolutely what I want to do with a pinball machine one of these days! The idea of re-arting an EM machine is sooooo cool! Check it out!!! Original link on Boing Boing! Last week I made yet another trip to Portland, Oregon for the International Comics Arts Forum. Last time I was in Portland I played as many different pinball machines as I could, zigzagging all over town, racking up a few high scores along the way. I approached this trip with pretty much the exact opposite strategy. 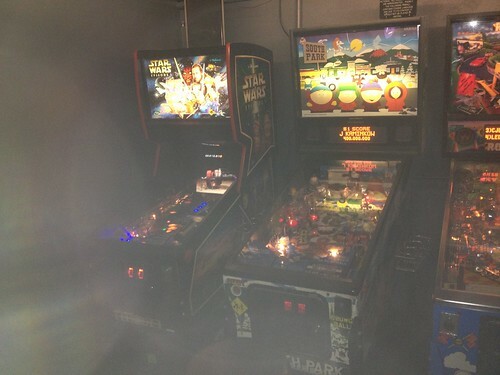 In four days, I only played one pinball machine: the Star Wars Episode One pinball 2000 machine at Ground Kontrol. I'm sure many of you think I'm insane. With the embarrassment of pinball riches that Ground Kontrol has to offer, let alone the rest of Portland, this was the only machine I played while I was in town???! Well, those of you who have read Drop Target #1 know that this is the machine that Jon and I learned to play pinball on. I am a devout Star Wars fan, I love the pinball 2000 technology, and I think this game is extremely fun to play. And now that I've crossed the threshold into actually beating games (Medieval Madness, Championship Pub, Who Dunnit) I really, really, really want to beat this game. I feel like it is the last test in my pinball training, and once that is complete I will be a "good" player. As luck would have it, ICAF was just down the street from Ground Kontrol. I had an hour and a half lunch break each day which allowed for a quick meal and then 2-4 games of SWE1. After the conference each day I would go and play a few more games before heading off to get dinner with my Portland friends. The SWE1 game at Ground Kontrol is currently in 99% perfect condition. The only issue is the ball trough sticking a little bit when trying to put a ball into the shooter lane, but usually when I find this game on location it'll be totally trashed (center gate not working, pop bumpers out) so this was as good as it was going to get! 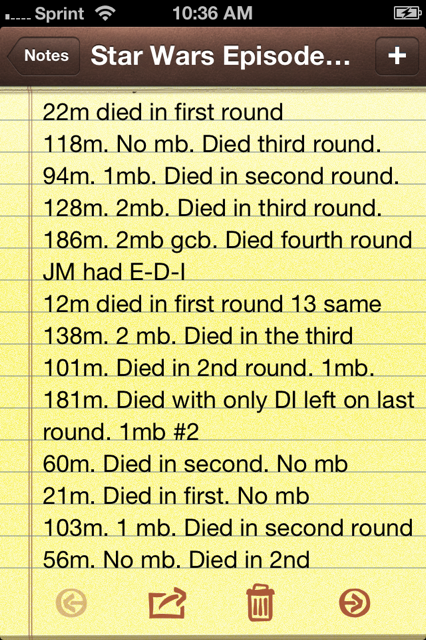 Using my new iPhone, I decided to keep track of every game of SWE1 that I played. 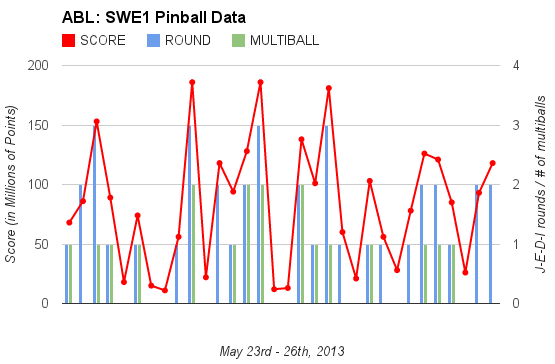 I noted my score, how many multiballs I played and then which "round" I died in. The four ranks are: Jedi Youth, Jedi Knight, Jedi Master, and Jedi Spirit. 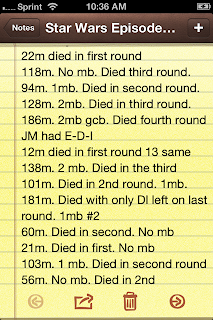 So for example "died in the second round" means that I collected all four J-E-D-I letters in the first round, beat Darth Maul to achieve Jedi Youth status and then died while trying to collect the J-E-D-I letters in the second round. Below you can see all of the compiled data from my 32 games. The red line represents my scores, with the four points above the 150 million mark being my only high scores of the weekend: 155m (#1), 186.6m (GC), 186.4m (#1), 181m (#2). The blue bars represent how far I got into a game, with a zero value meaning I died in the first round of J-E-D-I letters, a one value meaning I achieved Jedi Youth and then died in in the second round, two means Jedi Knight, three means Jedi Master, etc. etc. Obviously, how far I got into the game has a direct correlation to the score. The scores that are significantly higher than the game progress are explained by the number of multiballs played in a game, which was either zero, one or two (represented in green). On my four best games I achieved Jedi Master rank which I don't believe I had ever done previously (though Jon had) and my "best" game (in terms of trying to beat the game) was the 181m game. I died trying to secure the "D" in the last round of jedi letters - only one and a half modes away from achieving my goal! Although I did not accomplish my goal of beating the game, I did have some serious strategy breakthroughs that I believe will lead to an eventual victory. I'm going to lay them out below, but be forewarned! I'm going to write assuming the reader knows this game inside and out. If you don't, you can read a rule sheet here or SWE1 is the "Replay Review" machine in DTZ #1. The big breakthrough I had was realizing that the center shot is extremely dangerous when the gate is down. This sounds obvious, but there are lots of opportunities to strategically avoid the gated center shot, which definitely lead to longer, deeper games. For instance, in the first round, you can unlock and activate the projector without hitting the center shot. In that round only, the two standup disc targets will also serve this purpose, so I just made ramp shots, which eventually clip one of these disc targets, because my shooting's not that accurate. This breakthrough made me realize that very few modes require a gated center shot (Jar Jar Juggling: 1, Ground Battle: 3, Hanger Escape: 1-3). The rest of the modes do a great job of tempting you to use center shots when you really don't need to. For example in the three Amidala shooting modes, the "easiest" shot is the center gate because you have a larger area that her gun is sliding across. But it's dangerous! Instead, I focused on ramps - it might have taken a bit longer to get the required number of shots, but it's far safer, with consistent returns. The same is true of Podracing - there is often a flag at the gated center shot, but it's safer to shoot ramps, even if it means you have to clear a number of left and right turns before collecting another flag. You get the idea - take this idea and run with it! It'll definitely improve your game. The other breakthrough I had was to use multiball as a way to help get through some of the more difficult modes. When there is a risky shot, or a lot of things that need to be hit, why not have multiple balls bouncing around, so that you have some backup in case one of them drains? I mostly used this technique on the Destroyer Droids mode, which is brutal. You have to destroy six droids, and Amidala's gun is moving so erratically, it's really hard to hit. So I'd lock one ball, start that mode and then lock the second ball. Multiball runs during the mode, so I'd usually finish the mode just by knocking the balls around. Even better, if I was able to catch a few balls, I could shoot for the target knowing that I had some backup balls in case of a drain. Another idea that I really latched onto was the free C3PO awards. Basically whenever I had the ball on my right flipper, I shot the left orbit to work towards the free Extra Ball and free J-E-D-I letter. Once those were collected, the shot was dead to me (the next three awards are useless, and I don't really see myself ever getting to the sixth award, which is another Extra Ball). Those little boosts definitely help out! The last thing that really helped a lot me was more of a psychological breakthrough. There are thirteen modes in SWE1; some of them are very easy, some are very hard. But if you are going to beat the game, you are going to have to play them all. So while I played, I stopped cycling through the modes, trying to pick the "right" mode. I just played whatever came up randomly. Mentally I thought "At one point or another I have beaten all these modes, and I am going to have to beat them all right now, so I'll just take whatever comes at me." There are two exceptions: 1) Jar Jar Juggling has the ability to award an Extra Ball. I always play this mode first, because if it goes well, and Jar Jar does give me an Extra Ball then somewhere deep inside I think, "This is going to be a good game!" which usually leads to better gameplay. 2) for the "I" at the end of the first round I always play Jedi Musical Chairs. It has been my experience that you are much more likely to have a Jedi Letter award waiting for you in the first round, and there is a software bug that instantly ends the round when you collect the letter, thereby putting you directly into the lightsaber launch screen and giving you "J" in the next round. On the second day I had a feeling I wasn't going to beat the game. It's brutal playing the same machine over and over and over, with the goal of beating it. My mind got kind of numb and it became hard to distinguish one game from the next. I'm proud of the scores I put up, and I think I will be able to beat it someday, but I think it'll happen when I have more consistent access to the machine. If I could play it an hour a day, I think I'd have it beat in a month. Too bad I don't live in Portland! The only SWE1 in the Bay Area is at Playland-Not-At-The-Beach, which is too far away and too expensive to play every day. 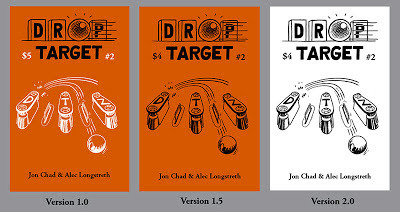 Drop Target issue two, second printing... sort of! 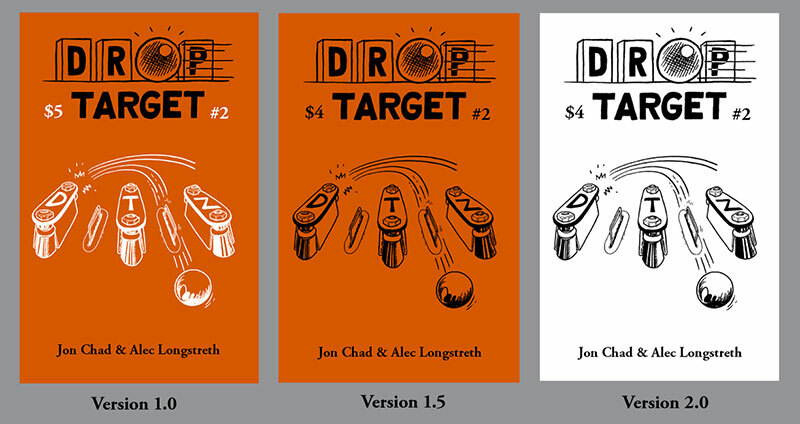 Well, it's official, the first printing of Drop Target #2 has SOLD OUT! We will no longer make any more of the "version 1.0" books, which have white screenprinted ink on the orange cover stock, and a full-color 8.5" x 14" fold out center spread. If you missed this issue, you still might be able to track down a copy from Portland Button Works or Pioneers Press. Jon had some extra orange paper left over, so we will be offering a "version 1.5" which is basically the second printing with orange paper. That means no screenprinting, a grayscale 8.5" x 11" center spread and a $4 cover price. There are about twenty copies of these, and then we will go to a full-on "version 2.0" which will have white cover paper (similar to the second printing of DTZ #1). Thanks everyone for scooping up these zines. It's exciting to think that 400 copies are out there in the world being read and passed around. We still have two more issues planned (#6 and #7) and then once all the first printings of all the issues sell out we will make a book collecting all the issues. Onwards! Happy Monday, faithful followers of the Silverball. I just remembered yesterday that I never shared the token that I designed for Pinburgh 2013. I had never done a coin before (which may surprise those of you who know of my unquenchable [semi-serious] love of gold), and I was really nervous about how the file would end up looking. 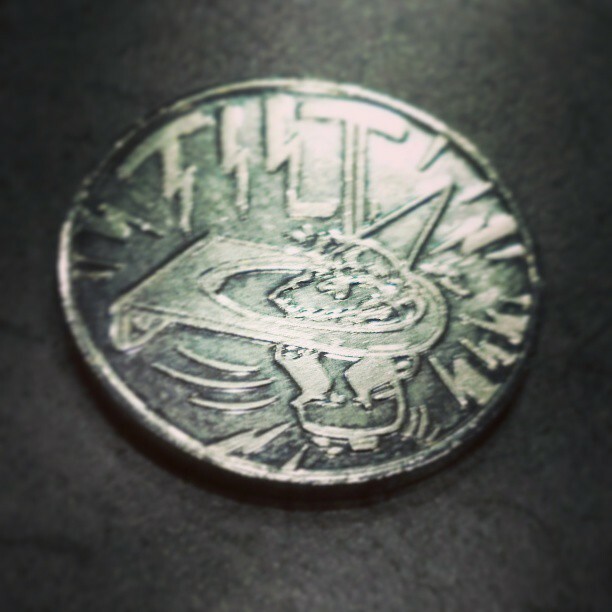 I was even more nervous when I sent a low res (72 dpi) jpeg of my coin design to my contact at PAPA and he said, "great, we'll use this! no need to send a high-res file." I have to admit that I was skeptical, but GEEZ, shows what I know! Looks pretty good! Pretty cool! Guys! 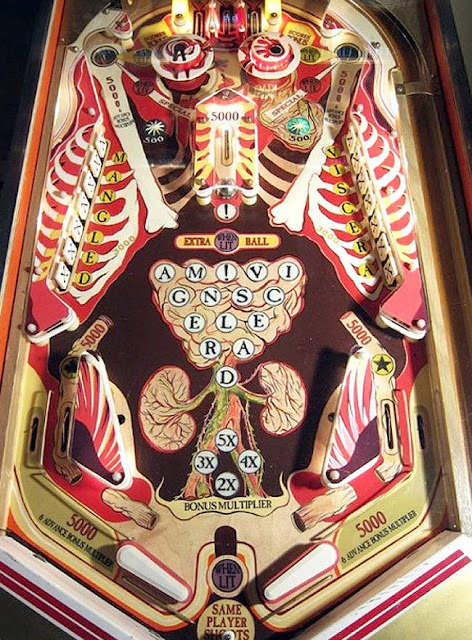 Get out there and play pinball! Support PAPA!